Size(s): (to fit, finished size) B/W/H: To fit 44″/36″/46, finished size 42″/38″/46″ (all fully closed and wrapped – not the way the garment is worn). Length 13″/33cm underarm to hem. 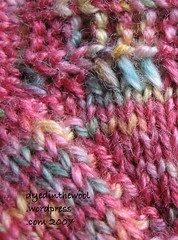 Knitting style: (for stitch patterns) All (stocking stitch, rib) in Combination/Eastern Uncrossed. Modifications: Knit several different sizes to accommodate my various in ‘n’ out bits, and did the necessary maths! I made the sleeves longer than recommended, to suit my personal taste. I worked two rows of double crochet (US single crochet) up the front edges. This was supposed to prevent them from curling, but it didn’t really work. However, they should help to stabilise the otherwise-unfinished edges. Notes: This pattern isn’t easy to knit unless you write the instructions out line-by-line. There are a lot of the “and at the same time” things and you really have to pay attention! As you can see from the photo, I had to take out 16 stitches at the underarms because it was way too baggy. I should have knit straighter at that bit and worked some short rows for the front. Never mind! I think I’d lengthen the body pieces, too. The 13″ finished length is a little on the cropped side for me, but I’m hoping the silk/cotton will droop with wear! If I were making this again, I’d work more rows of rib on the bottom edges to stop them from curling (they did block flat, but the tendency will still be there). Over all, I’m pleased with the finished product and, for me, this was a very quick knit (6 weeks)! All posts relating to the Wren cardigan can be found here. … knit stoned. Legally, prescribed, stoned, I hasten to add! Seriously, painkillers plus something to stop my muscle spasms makes for some very interesting knitting! I stuck to stocking stitch (the second Wren sleeve) and only during the adverts of “Sideways” and then “Victim“. So, despite accidentally taking those pills together (which I’ve done before, and forgot why I’m not supposed to!) I’ve managed to make progress! I’m this close to finishing. See? There is just some seaming to do and then the wait for non-rain-weather. Wish me luck! I’m much happier with v2 of the Summer of Socks design. Why? 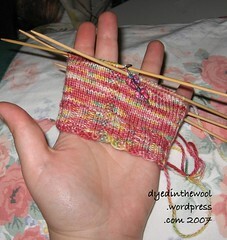 Because I actually knit the correct number of rows in the heel flap (32 instead of the first time of 22). Huh! Surprisingly, it fits so much better! I originally went with a round toe for the sock, but in order to make the numbers work for all sizes (and because it fits my toe better) I’m going a different way for the new version. Still slogging on Clue 3 of the Mystery Stole. The Cotton Angora top (Jessica) is on holiday until I finish Wren. The Boudica socks have taken a well-earned chariot vacation until I’ve settled on the Turing design. 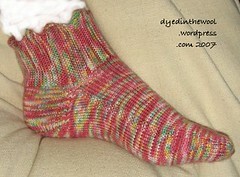 I’m going to need I’d like a test knitter for the Turing sock. 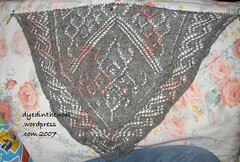 I should have a workable pattern (in three sizes) by next week, but I’ll knit one size from my own instructions. 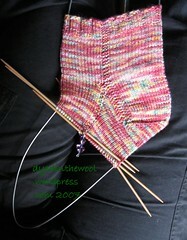 You’d have to be able to knit at least one sock by the end of August. I’m looking for someone with tiny feet (about 6-7″ circumference) and larger feet (about 9″ circumference). EDIT: I made a mistake with the sizes. The larger size would be more like a 10″/25.5 cm fit and the smaller 7-8″/18-20 cm. Any takers for the smaller size at all? You wouldn’t be able to blog about it until after the pattern is released (late September at the earliest). You: a regular reader and commenter, speady sock knitter with a grammar-obsession. Wren "turing and the apple" "summer of socks"
OMG!! The Sun!!! I think I might be using the exclamation point a little too much!!!! Of course, the sun has now gone again, but that day and a half of summer was lovely. I may not make it to my self-imposed deadline of the end of this month, but I’m not going to be far off. I’m still undecided about what I’m going to do about the neck and front edges. I’m currently leaning towards a narrow, short-row-shaped collar in 1/1 rib with two rows of double crochet (US: single crochet) for the front edges. At least I can rip it out if it’s not quite right, unlike sewing! Hence forth known as the Turing socks, named for Alan Turing. Version 2 of my Summer of Socks design. Notice the sub-conscious “Live Long and Prosper” sign I did with my hand. Geek much? I have listened and obeyed! 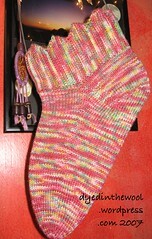 Actually, the comments were spilt between “Careful with that cruel mistress, vertical garter stitch” and “cute socks!”. I mulled it over, and decided to go down a more conventional, well-trodden, path. I feel I’ve kept some of the details of the original, but with some refinements. In any case, these are a pair of socks I’m looking forward to wearing myself, regardless of how the designing goes! Still slogging along on Clue 3 (Clue 4 was released today). I’ve finally updated my “Podcasts” post and gone through all of the posts from the Blogspot blog to remove the “uncategorised” tag and assign relevant labels. It took me a while. I got there eventually! *”My dear old thing” is a phrase well known to Test Match Special listeners as it is frequently uttered by the unique Henry Blofeld. The closer I get to a hairdressing appointment, the more concerned I get about how my hair and scalp look. I have a skin condition which means I have problems with my scalp and face and every time I have my hair done I’m convinced that either the washer or my “stylist” is going to say something. That, combined with the inevitable spot you get right in the middle of your face three days before hand, makes me very paranoid about my appearance. And then they go and wash your hair for you anyway, and do a better job than you can do for yourself! That was a very long-winded way of saying that I’m going to the hairdressers! On to the knit! Left photo is without flash and right is with. I pinned Wren up and attempted to take photos to see how it looked on me. I quite like how the neck is open and I’m not sure I’d like the massive collar on it. I’m thinking about a couple of rows of crochet around the front edges. Oh, and the curling hem does block out. Woo Hoo! I’m now on the second sleeve, and I’d like to actually finish this red item within the correct two-month cycle of Project Spectrum, so I’ve got to make a decision. Soon. It stands for Summer of Socks, but also a plea for help and/or reassurance. I know I said I wouldn’t show the design I was working on until I’d finished, but I’m not sure we are liking the finished project. I love the idea and the inspiration behind it (all to be revealed if I stick with it) but I’m not totally sold on the execution. Garter stitch is a continuing element (from the cuff, to the heel and the instep) and I like the way it breaks up the colour a little. The idiot neighbours who think it’s a good thing to lock a child in a room and ignore them while they are having a toddler tantrum. When they’re 11 years old. 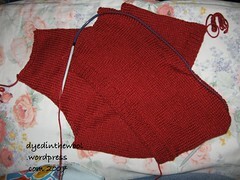 I’ve finished the right front of the Wren cardigan and I’m just about to do a three-needle cast off on the shoulders. There is some inconsistency in the fabric and I don’t know whether to block the pieces now or wait until I’ll finished everything. Any advice? 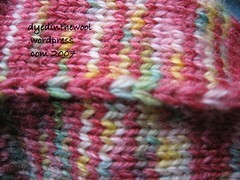 The yarn is a bamboo/superwash wool mix from Anne in the MacIntosh colour. I am reliably informed that it does accurately resemble said apple, but I can honestly say that I’ve never seen one! The third clue for the mystery stole has been released, but I’m still slogging away on clue 2. I’m a proud member of the Slow-Bee group, as imagined by Bonne Marie. There is a button and everything! If you want one, save it to your own computer and then upload it to your own image server, please. Thank you, darlinks. Erm … I think that’s it. Yup. Sorry, pretty boring that, wasn’t it? I’ll try and have a more interesting life between now and the next post. Shall I train to be a fighter pilot or run hobble away and join the circus?